Three papers appeared on the arXiv last night about using observational data to constrain the cosmological parameters of the universe. The authors combine data from a variety of surveys to measure the scale of baryon acoustic oscillations as a function of redshift and then use their results to constrain the geometry of the universe. They find that their results are consistent with the standard ΛCDM model of the universe, which states that the universe is flat and primarily composed of dark energy. For more details about dark energy and ΛCDM, see these astrobites. As explained by Berkeley astronomer Martin White, baryon acoustic oscillations (commonly abbreviated BAO) are essentially frozen sound waves left over from the early universe. Prior to recombination, matter and photons were coupled and fell together into the overdensities in the dark matter distribution. As the concentration of matter and photons increased, the radiation pressure between photons became larger than the gravitational attraction between the protons. The net outward force drove waves of photons away from the overdensities and because the matter and photons were coupled, baryons accompanied the photons. As the acoustic waves traveled, the universe cooled down. At a redshift of roughly 1100, the temperature became low enough that electrons and protons were able to combine to form atoms (this era is known as “Recombination” even though the electrons and protons had not been combined before). The formation of atoms decoupled the baryons from the photons and the baryons remained in spherical shells around the overdensities while the photons continued to stream outward. Since the wave of baryons had been traveling at the sound speed, astronomers can multiply the sound speed by the age of the universe at recombination to estimate the diameter of the shell, which is known as the “sound horizon.” In the standard cosmological model, the scale of the shell is roughly 150 megaparsecs. From measurements of the Cosmic Microwave Background, astronomers know that the angular scale of the fluctuations is roughly one degree. Because both the physical size and the angular scale are known, baryon acoustic oscillations are an excellent tool for probing the physics of the universe. 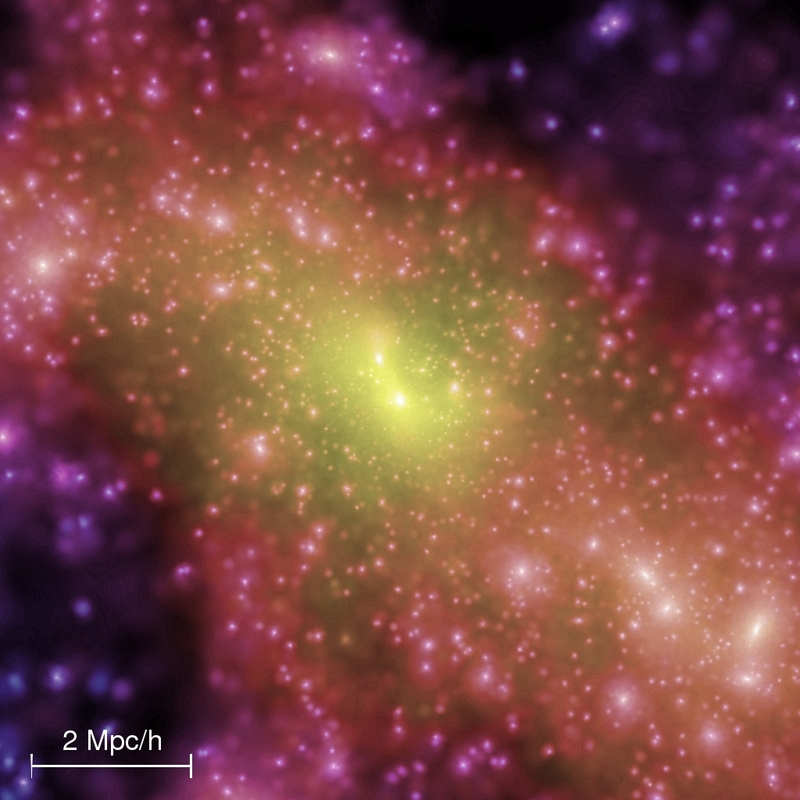 The clustering of galaxies today depends on the initial distribution of matter in the universe, so astronomers can use the clustering of galaxies today to reconstruct the original density field and uncover how the expansion rate of the universe has changed over cosmic time. The three papers posted on the arXiv last night each tackle a different step of this complicated process. Before you head to the arXiv to read this fantastic series of papers, check out the blurbs below for a summary of what to expect in each paper. This paper sets the stage for the rest of the series by using a reconstruction algorithm to recover baryon acoustic oscillation features from the clustering of galaxies. Although baryon acoustic oscillations are an excellent “standard ruler” for measuring cosmological distances, the nonlinear evolution of the density field of the universe can “smooth” the BAO features. The reconstruction algorithm reverses the smoothing so that BAO features appear more clearly and astronomers can better determine distances. As the first group to apply a reconstruction algorithm to galaxy clustering data, Padmanabhan et al. are able to reduce the error of the distance measurements of their galaxies from 3.5% to 1.9%. This is an impressive result because reaching the same precision without using a reconstruction algorithm would require tripling the survey volume! The second paper in the series discusses the details of how the team measured the acoustic scale. Xu et al. check their procedure by applying their reconstruction and fitting techniques to mock data and determining the measurement error. 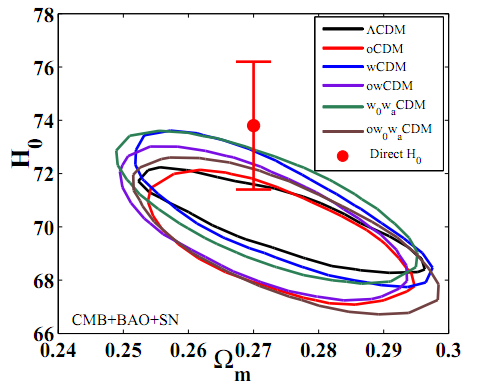 The final paper of the series considers the implications of their BAO distance measurements on cosmological parameters. Mehta et al. present measurements of the Hubble parameter, the density of matter in the universe, and the dark energy equation of state parameter. All of their results are consistent with the standard ΛCDM model, but they mention that their results would also be consistent with a model containing a fourth flavor of neutrinos. Resulting measurements of the Hubble parameter H0 and the matter density Ωm for a range of different cold dark matter cosmological models. In all cases, the values agree with the direct measurement of the Hubble parameter by Reiss et al. 2011 (the red point). Figure 13 from Mehta et al. 2012.